Social networks share a common ingredient in design and intent, the connection of people and the facilitation of conversations, sharing, and discovery. What they do not share however, are culture, behavior, and prevailing demographics. Each network is unique in its genetic and cultural composition and it is for that reason that we benefit by becoming digital anthropologists in addition to new media marketers. Demographics are distributed within all social networks, but only concentrated within a select few. Where specific demographics materialize varies from network to network and as such, the more effective social strategies and tactics are designed to reach target audiences where, when and how they engage. Over the years, I’ve relied on Google Ad Planner to surface the critical demographics in order to construct meaningful and targeted social programming. Pingdom recently examined the data and packaged the results in a visually rich presentation worthy of sharing. The disposition of age groups within social networking as a whole is representative of the state of social media engagement, but this is fleeting. Age groups will only continue to meander as online networking becomes pervasive. 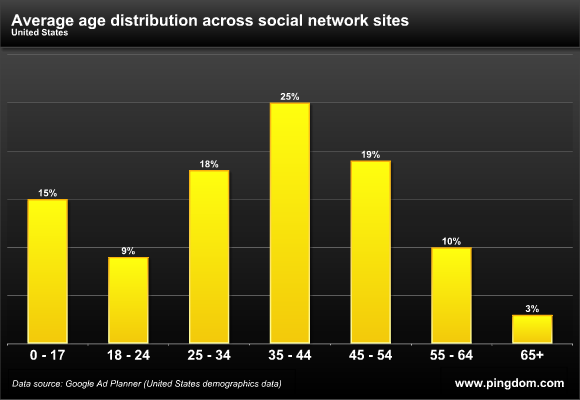 At the moment, we can see that those 35-44 dominate the social web, representing 25% of total participation. For those who have actively monitored adoption of social networks, this next stat might not come as a surprise, but it’s worth highlighting nonetheless. Following at 19% isn’t a younger generation at all, in fact, those 45-54 are the second most active group within social networks, just ahead of the 25-34 segment at 18%. Individuals under 17 rank fourth with 15%. I find it fascinating that the 45 to 65+ group, those who are usually considered laggards in the technology adoption cycle, symbolize almost one-third of total users of social networks. They’re equally connecting with not only each other but also the younger generations who are spending an increasing amount of time online as well. 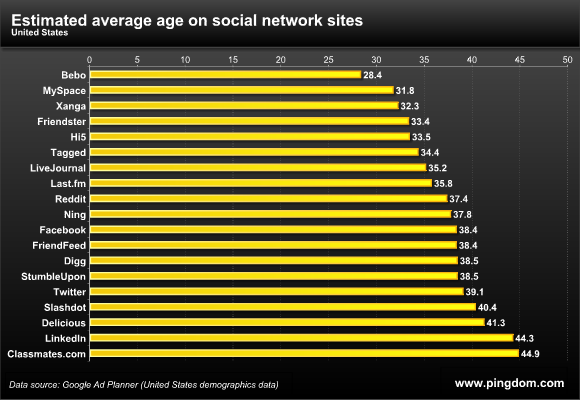 Reviewing the age groups broadly across social media serves only as a primer to the deeper level of analysis required to identify exactly where we need to connect with target demographics. 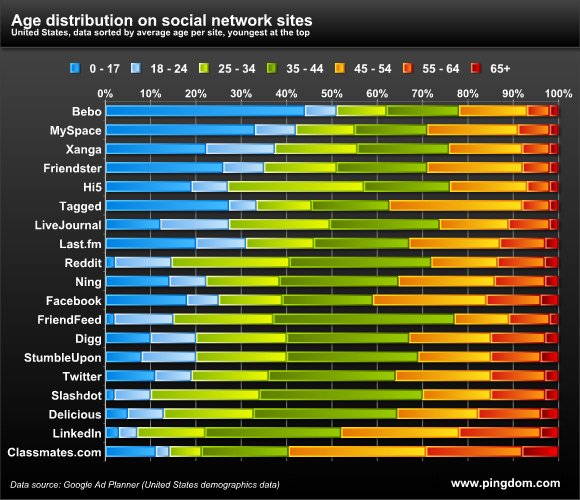 As such, Pingdom performed the first level of segmentation to showcase how age groups are distributed within each specific social network. Cascading further down stream, the data when crunched, reveals the average age per network, which allows businesses to better understand the general user within each. In social media, not only do women rule, but it seems that the middle-aged are Social Media’s largest share holders. Again, the average number is just that, a generalization of users classified by age, not by usage, theme, or connectivity. As we identify whom it is we need to reach and why, analyzing data as it relates to age groups is just one side of a multi-faceted program. In order to possess and convey value and meaning, it is anthropology, sociology and the psychographic mapping of people to themes, interests, and aspirations that will prevail now and over time. 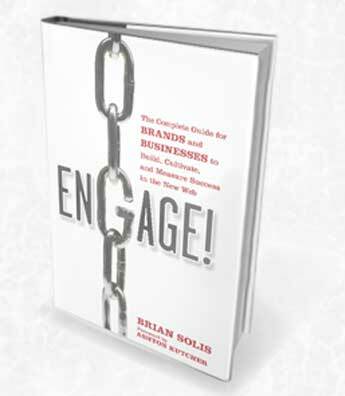 It’s the difference between visibility and presence, and in social media, presence is felt.